Sunday, July 8th at 2:00 PM. The heritage of Rodeo grew in small towns with ranchers trying to outdo each other with their favorite horse, and Rodeo is still alive today because of it. La Pine Rodeo is growing bigger each year with more people coming to watch the cowboys try their hand at winning the prize. Each and every event began with a function that the cowboys used on the ranches and holding onto the history that shaped our Country is so very important. The Northwest Professional Rodeo Association is the western United States largest regional rodeo organization. 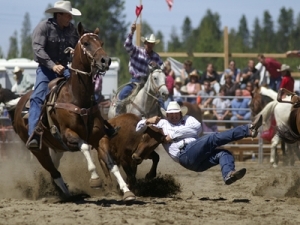 It annually sanctions over 40 rodeos throughout Oregon, Washington, Idaho, Nevada and California. Its membership continues to grow and represents the finest caliber of rodeo athletes in the country! The NPRA rodeo season begins in October with a few indoor rodeos through the winter months, increases to a “multiple rodeos per weekend” schedule through the summer months, and climaxes in September at the Championship Finals. The NPRA is proud of the opportunity it provides for rodeo athletes to compete at the professional level while remaining close to home, families, and weekday jobs. It promotes a wholesome family atmosphere and continuously works to improve contestant and livestock conditions. It is dedicated to preserving the western heritage that is an integral part of rodeo. The spirit of the west is alive and flourishing at NPRA rodeos throughout the northwest region. Thousands of rodeo fans have discovered that the sportsmanship, the level of competition, the quality of livestock and the exciting rodeo action seen at NPRA rodeos is the “Best in the West”. Watch for an NPRA sanctioned event near you this year and come see for yourself! Bring the whole family and enjoy the fun and excitement of The Great American Sport of Rodeo – NPRA style! Read more about the NPRA. We will be holding onto the history and making some of our own this year, and we encourage each and every one of you to come and share this great weekend with us. Buy your La Pine Rodeo Event Tickets here!